This phrase, "Better Turkish Than Papist," was the slogan of the Dutch Navy during the Dutch Revolution against Catholic Spain. Zwarte Piet is today regarded as a symbol of the Dutch Revolution (1568 to 1609) and that the Dutch remember this very well! Apparently this is why they do not see Black Pete as racist like everyone else does. Is Pete really a positive figure, an ambassador of a far away nation that was known to be more religiously tolerant than Spain, a figure who supported Dutch freedom? Or is he just an offensive caricature who desperately needs a makeover? After I published the article I heard from a woman I know named Wil D., an American citizen who was born and raised in Holland. According to her, the Dutch today remember very well the revolution against Spain and they consider Zwarte Piet as having come down to them from that time. 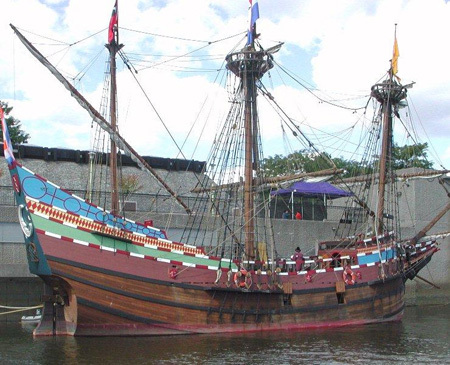 During the revolution against Spain [1568 - 1609, the last being the year the Halfmoon sailed up the Hudson] he Dutch apparently imagined that the Turks (Ottoman Empire) were their effective allies, i. e. "an enemy of my enemy is my friend." 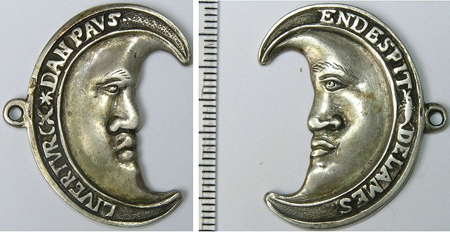 This took the form of placing the Islamic moon and stars on their revolutionary banners, along with a pro-Turk declaration. They did this to annoy and anger their Spanish enemies. It appears that both the Protestant Dutch and the Catholic Dutch were demonstrating to Catholic Spain that their Dutch nationalism was of greater importance to them than religious divisions, that is, the Dutch Catholics would remain loyal to the revolution. And here's the wildest bit of all: the ship name "Halfmoon" is a relic of that revolutionary attitude! 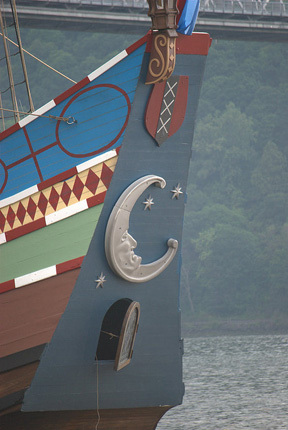 Henry Hudson’s ship sported a patriotic name, an homage to the Islamic “Turks” that was meant as an insult to the Spanish. (The Dutch, of course, had no intention of joining the Ottoman Empire and turning Islamic, their single goal was independence from their Spanish oppressors. Black Pete, as I understand it, is thought by the Dutch to have been added to the Sinterklaas tradition as a representative of "The Moors" who were their "allies." The Western Europeans of 400 years ago would usually encounter people from the nominally Ottoman states of North Africa, which were ruled and populated by darker skinned "Moors" not lighter skinned Turks from Anatolia. Thus to the Dutch of four or five hundred years ago "Moors" were "Turks." And then there's the oranges from Spain, handed out by an enemy of Spain, the black face and frizzy wig "Moor." To me these oranges sound like tribute (or loot) from the enemy. An old song says that in Spain “oranges roll down the street” and that Black Pete collects and carries those oranges to Holland. Thus, to the modern Dutch, there is a strong strain of patriotism in the presence of Zwarte Piet and with the oranges handed out to children. This easily explains their stubborn defense of a character who looks like a racist minstrel show, and why they implausibly (to an American) maintain that he is not racist. And thus many or most Dutch see criticism of their patriotic figure as an attack on their own identity. I'm told that every year the Dutch-American community around Albany holds Sinterklaas celebrations with all the Dutch trappings... including Black Pete. This is not surviving tradition from the 1600s, this is recent Dutch immigrants keeping up their customs from the old country. Wil D. and her American born husband used to bring their kids to these annual gatherings. But eventually their kids didn't want to go anymore. You see, apparently among these Albany-area Dutch immigrants Zwarte Pete has a bit of Grus Vom Krampus in him and indeed punishes the naughty children. This takes the form of public airing of some of the naughty acts of the last year by the naughty kids. And really, they've all been naughty. Obviously Americanized kids will not put up with such stuff. We like to pretend to forget. BTW, down in Rheinbeck I hear they have an annual arrival of Sinterklaas by boat. However, he arrives alone. To hell with that kind of historical abortion. Bring back Pete or don't do it at all. If you don’t like Zwarte Piet, and there’s a lot not to like, then update the character. Give him some dignity. That's my position, as you can see from the article that I wrote. A Patriotic Pendant (circa 1570) From The Dutch Revolution. The left side says "Better Turk than Pope" and on the right side "Despite The Mass," in other words, better to miss the Christian sacraments and burn in Hell than submit to the Spanish.